Have you ever wanted a top-of-the-line combat pistol, one that was designed and built from the ground up for one purpose and one purpose alone: to keep its bearer alive? Well, I recently was given the opportunity of testing just such a handgun--the Nighthawk Custom 10-8--and I was impressed. Nighthawk Custom is located in Berryville, Arkansas, and specializes in custom 1911 pistols. The staff includes some of the most noted 1911 master craftsmen in the industry today, with more than 75 years of combined experience. Nighthawk will produce a pistol to the customer's exact specifications and purpose--military/police service, concealed carry or even competition--but if you examine the catalog it quickly becomes obvious that Nighthawk's specialty is the no-frills combat pistol. Now, no frills does not mean that the pistols are not attractive, but most of them display a subdued exterior that, to my way of thinking, emphasizes their intended role as serious, combat handguns. Nighthawk pistols don't have any features that aren't absolutely necessary for the task at hand, but they do possess every feature that is. The Nighthawk 10-8 was designed in collaboration with 10-8 Consulting, which provides consulting services, small arms/tactics training and specialized products for law enforcement, military and private security professionals. At first glance, the 10-8 appears to be sort of a plain Jane pistol, but close examination shows the quality of parts and workmanship that went into it. The steel slide features front and rear grasping grooves, allowing the shooter to charge the pistol with a variety of grips or when wearing gloves. The ejection port is lowered and radiused to ensure positive ejection of spent cases, and all of the edges--including the sights--have been radiused. Possibly the most attractive (and practical) feature of the 10-8 are the sights. The super rugged 10-8 Performance rear sight, designed by pistolsmith Hilton Yam, is machined from hardened bar stock and features a generously sized U notch while the front of the slide has been cut to accept a Trijicon night sight. This combination provides a sharp sight picture and allows fast target acquisition and transitioning, even under low-light conditions. A stainless steel match grade barrel, with a nicely crowned muzzle, is positioned by a stainless steel, match barrel bushing. Unlike many of today's custom 1911s, the 10-8 uses the standard recoil spring setup. The forged steel frame boasts an integral plunger tube. 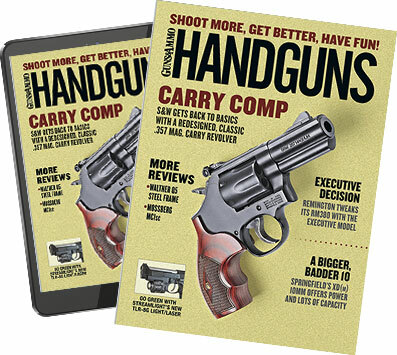 The gun has a long, aluminum trigger--with a hidden overtravel stop--and the slide release, thumb safety and magazine catch are all extended, but not so much that they interfere with normal handling or most styles of grip. An extended beavertail grip safety provides enhanced recoil control and comfort. The 10-8's VZ Diamondback grips' textured surface provides a secure purchase and superior recoil control. In fact, I believe that you'd have to tear the skin off the palms of my hand to get this pistol away from me. To improve overall handling even further, the frontstrap and mainspring housing are checkered, and metal has been removed from under the trigger guard for a high grip. The magazine well opening has been aggressively beveled to ensure smooth reloads while a lanyard attachment point is located on the bottom of the mainspring housing. As is now standard on most duty-type pistols, the 10-8 comes with a Dawson Light Speed Rail for mounting tactical lights and other equipment. Finally, the entire pistol is finished with a high tech ceramic finish known as PermaKote. Its flat-black appearance is not only eminently practical for a combat handgun but bespeaks ruggedness. The slide stop, thumb safety and magazine catch are all slightly elongated, and the extended beavertail grip safety makes for comfortable shooting. The VZ Diamondback grip panels provide a firm hold. At our first opportunity, my friend Butch Simpson and I headed for the range with the 10-8 and a lot of ammo and ran it through the standard accuracy testing with five different types of .45s, the results of which can be seen on accompanying table. The pistol showed a definite preference for lighter, faster projectiles--with honors going to Speer 200-grain +P Gold Dots that put five rounds into an impressive 1.38 inches--but the 10-8 produced impressive groups with all five brands of ammunition. I then set up a pair of USPSA targets, and Butch and I spent an enjoyable hour running the 10-8 through a series of offhand drills at seven, 10 and 15 yards, firing the pistol supported and unsupported (one handed). We were both impressed with the 10-8's accuracy, sights, handling, reloading speed and overall ergonomics, and out of the many rounds we fired, only two landed outside the A zone. Butch was likewise impressed by the sights, noting that they were easily picked up in the dappled shade of midafternoon. That evening, I reshot some of the same drills under low-light conditions and found the 10-8's unique sighting arrangement to be one of the more practical I have ever used. Unlike with a three dot system--where I always seem to waste time attempting to line up the dots--with the 10-8's wide rear notch and single glowing dot up front I could quickly and accurately engage multiple close-range targets. I also used the 10-8 to compete in several local USPSA matches and found it to be a fine handling, fast shooting pistol. Using Cor-Bon's Performance Match ammo, I was able to engage multiple target arrays quickly and accurately, recoil control was above par, and both the pistol and its magazines functioned 100 percent. In one match I captured second place with a respectable 78.04 percent score, so I can tell you this is one shootin' pistol. I can think of only one thing I'd change on the 10-8: an arched mainspring housing. I tend to shoot low with a 1911 fitted with a flat housing and cannot for the life of me understand their current popularity, especially on custom pistols. I would also prefer a slide stop lever that has less extension. Having said that, though, Nighthawk's 10-8 is without a doubt one of the finest pistols I have ever had the chance to shoot. And while it costs a lot, remember that quality has its price, and it is generally worth it.